Highly diverse plant communities such as those found in tropical forests and calcareous grasslands are an ecological paradox: if plant species differ in their competitive abilities, what prevents the best competitors from excluding weaker species? Research in our group addresses the role of natural enemies (pest and diseases such as insect herbivores and pathogenic fungi) in promoting coexistence of plant species. Much of our work is inspired by the ‘Janzen-Connell hypothesis’’ which suggests that host-specific enemies are most problematic for their host species in areas where it is common. By favouring species that are locally rare, this negative feedback mechanism can prevent competitive exclusion. 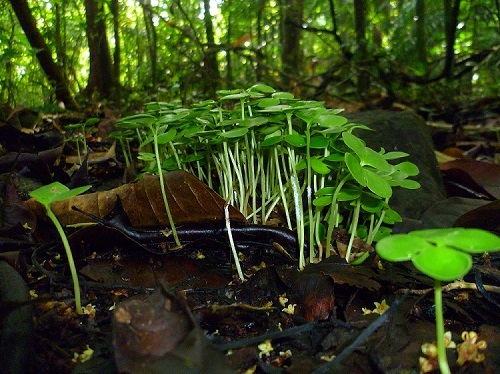 Working in both tropical and temperate ecosystems we use experimental and observational approaches to address the role of different types of enemies (pathogens, insect herbivores and seed predators) in maintaining plant diversity through the Janzen-Connell mechanism and similar processes. Current work also tests whether the diversity-enhancing role of enemies varies across environmental gradients – in this case focusing on the strong rainfall gradient across the Isthmus of Panama. In a related strand of research we address the possibility that natural enemies contribute to structuring plant communities through ‘enemy-mediated indirect interactions’. Where plant species share enemies, the success of one species may depend on the presence of alternative hosts of its enemies. We test this idea using experiments and surveys focusing on plant species known to be attacked by the same species of enemy. A particular challenge for this type of studies is the general lack of information on community-level patterns of enemy host use in many plant communities. We aim to contribute to filling this information gap focusing in particular on internally feeding insect seed predators in tropical forests. Field work is mostly taking place in Panama (Barro Colorado Island and multiple sites across the Isthmus of Panama) and in the UK (Wytham), focusing primarily on enemies attacking plants at the seed and early seedling stage. Work on this theme is funded by NERC and by the Royal Society. Bagchi, R., Gallery, R. E., Gripenberg, S., Gurr, S. E., Narayan, L., Addis, C. E., Freckleton, R. P. & Lewis, O. T. (2014) Fungal pathogens and insect herbivores modify rainforest plant diversity and composition. Nature, 506: 85-88. 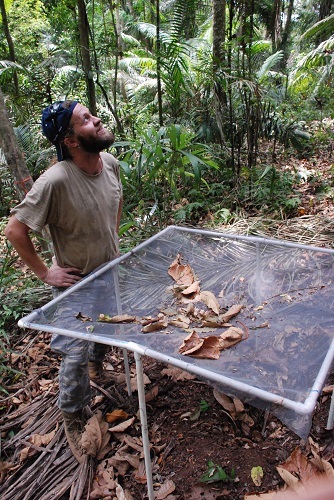 Gripenberg, S., Bagchi, R., Gallery, R. E., Freckleton, R. P., Narayan, L. & Lewis, O. T. (2014) Testing for enemy-mediated density-dependence in the mortality of seedlings: Field experiments with five Neotropical tree species. Oikos, 123: 185-193. Bagchi, R., Swinfield, T., Gallery, R. E., Lewis, O. T., Gripenberg, S., Narayan, L. & Freckleton, R. P. (2010). Testing the Janzen-Connell mechanism: Pathogens cause overcompensating density-dependence in a tropical tree. Ecology Letters 13: 1262-1269.